Cultivated varieties are now supplied singly in 1/2 litre pots. 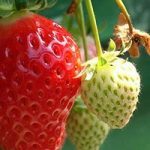 We also supply a range of strawberry species for fruit and ground cover. The fruits are smaller than modern varieties but the flavour is often better! Pot grown.